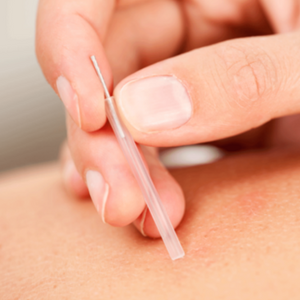 Medical acupuncture (dry needling) is a type of acupuncture only to be administered by qualified physicians and is used specifically for the treatment and management of muscle, bone and joint pain. It is used to stimulate the body’s own healing response and accelerate the innate healing mechanism, by stimulating blood flow, reducing areas of tightness, inflammation and pain. We offer acupuncture as part of your osteopathic treatment or as a stand alone therapy. It can be an excellent treatment for low back pain, headaches and neck pain especially when used in conjunction with other osteopathic techniques. However, it can be safely used on most muscles and joints of the body as an effective treatment for both acute and chronic injury. Acupuncture uses a series of small needles administered directly into the pain-causing tissue and although there may be varying sensations felt by the individual, it is not a painful treatment and often there is a significant reduction in symptoms after the very first treatment! As with all osteopathic treatment, the patient is required to give full consent. If the patient feels uncomfortable at any point during the treatment, the procedure can be stopped and an alternative treatment option will be offered.